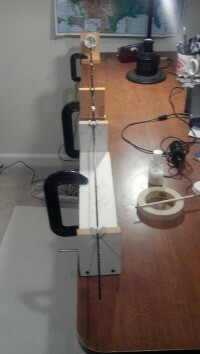 Shortly before Christmas I built a 9′ 4 wt rod based on a J Stockard Forecast fly rod kit. It has a blue 4-piece Batson IM6 blank, a gunsmoke reel seat with rosewood insert, and a quality cork grip. Including shipping it was $90. Add in a $5 rod bag from BassPro and a rod tube from LL Bean for $8.50, and you have a nice custom outfit for right around $100. It was the first time that I had built a fly rod from a kit, and I would recommend the Forecast package. I fished this rod almost exclusively for the past month, and have really enjoyed it. J Stockard’s customer service is also outstanding. See my recent post on J Stockard’s customer service here. As luck would have it, a couple of weeks after this build I had a chance to pick up another 4-piece 9 ‘ 4 wt for $25. This one came with 2 tips. I placed a call to J Stockard and purchased their TFO Rod Component Kit, TiCr Series, along with enough parts to complete the second tip. Parts and shipping totaled $36, but discounts and earned credits from prior purchases brought the total down to $25. It came with a rod bag, so I called LL Bean for another rod tube. 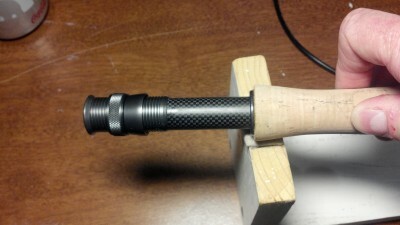 Below is a pic of the reel seat and grip. The TFO kit came with a graphite reel seat and metal frame. I think it looks nice, and the cork used in the grip is good quality. This is usually one of the first items that I epoxy to the rod blank after finding the spine for each of the rod segments. Next it was time to wrap the ferrules, guides, hook keeper and glue on the tip tops. I epoxied the tip tops and reel seat at the same time. This pic shows most of the tools that I use to wrap. 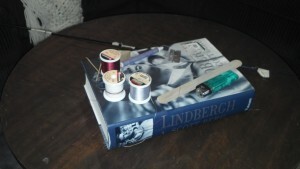 I have tried using rod wrapping tools and tensioners before, but I prefer to run the thread through a large book to provide resistance. I use a razor to cut off the thread at the end of a wrap, and a lighter to remove or shrink any fuzz or tags. The nail file is to smoothe any rough spots after the first coat of epoxy is applied to the wraps. Here is a pic of the two middle sections in the rod turner. Both have color preservative applied and the first coat of epoxy. They turned for around 8 hours, and I let them dry for another day before applying a second coat. This morning I took it out for a lawn casting session. It is a mid-flex rod with medium action. It is well balanced with my Okuma Sierra reel and casts easily. So for $60, I now have another 4 wt with two tips. This will be a perfect rod to throw in the back of the car for last minute trips or when I’m driving and come upon a stream that looks interesting. Here’s to an early spring and plenty of fish. Enjoy! Here’s another Xtranormal video. This time the discussion is about the benefits of purchasing a high-end fly rod. This weekend I’m heading to Penns Creek with my friend Patrick for 3 days of fishing. Since it is a 5-6 hour drive into the middle of rural Pennsylvania, I’m planning on packing the following items for the stream: rods, reels, boots, waders, hat with built-in light, sunglasses, magnifiers, vest, an assortment of flies, tippet, extra leaders, strike indicators, split shot, pliers, nippers, floatant, cameras, bug repellent and sunblock. We were able to find an inexpensive cabin in Coburn, so no camping gear for this trip. I’m packing extra clothes, sleeping bag, towel, toiletries, beverages, trash bags, paper towels, coffee, water and power bars. What do you take on your out-of-town trips?